Appiano is a good starting point for tours with your two-wheeled companion. Appiano is perfectly suitable as starting point for motorbike tours. Mountain streets, a beautiful landscape with mountain roads, passes and hospitable accommodations, what more could one want? The closest mountain pass is the Passo della Mendola, that is to say the local mountain of Appiano, that can directly be reached starting from Appiano, driving along 15 hairpin beds. In summer, on the top of this mountain the climate is very pleasant and cooling. More destinations that are easily accessible from the Oltradige region. Are you familiar with the following mountain passes? 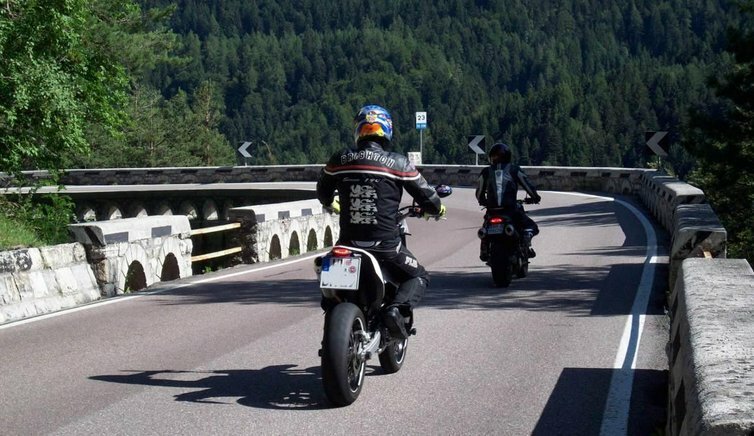 The most popular passes of South Tyrol are probably the Passo Resia and Passo del Brennero, but you should also make a ride to the Passo dello Stelvio, the Passo Sella, the Passo del Rombo, the Passo Gardena, the Passo Monte Giovo, the Passo Costalunga, the Passo Stalle, the Passo Palade, the Passo di Pénnes and the Passo Monte Croce. Ask in your accommodation for more fabulous bikers’ destinations.